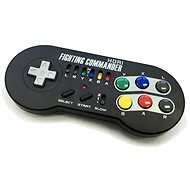 Wireless Controller (with a USB dongle) to Mini SNES and a different layout of controls than the original Nintendo driver. The brand new DualShock 4 controller designed for Sony’s latest console PS4 combines a host of new features with intuitive, precision controls. Its unique in-built motion sensor enables extremely sensitive motion control, while the clickable touch pad located at the top of the controller enhances the way you experience and interact with your games. The feel, shape, and sensitivity of the classic DualShock analog sticks and trigger buttons have been enhanced to offer players absolute control for all games on PlayStation 4. The addition of the SHARE button makes sharing your greatest gaming moments as easy as a push of a button. Upload gameplay videos and screenshots directly from your system or live-stream your gameplay, all without disturbing the game in progress. There is also an in-built speaker and you can stay in contact with your friends thanks to the classic audio and microphone connector. The Light Bar at the back of the controller activates automatically when needed. The bar changes colour depending on the game and situation, which can help you to keep track of your character when playing in a multiplayer mode or alerts you when your character gets wounded. Your gaming experience is further enhanced by the controller’s improved vibration function. For shipping to other EU countries visit this page Sony PS4 DualShock 4 (Glacier White). Für Versand nach Deutschland, besuchen Sie bitte Sony PS4 Dualshock 4 (Glacier White). Chcete doručit zboží do Česka? Prohlédněte si Sony PS4 DualShock 4 (Glacier White). Chcete doručiť tovar na Slovensko? Prezrite si Sony PS4 DualShock 4 (Glacier White). Für Versand nach Österreich, besuchen Sie bitte Sony PS4 Dualshock 4 (Glacier White). Magyarországra történő kiszállításért tekintse meg ezt a termékoldalt: Sony PS4 DUALSHOCK 4 (Glacier White).